Check out Generals’ Wives, our new twelve month BOM program honoring the wives of 12 prominent generals who served during the Civil War. April 12, 2011 marked the 150th anniversary of the firing of cannons on Fort Sumter, South Carolina. It marked the opening day of the Civil War; a war that would divide families, friends and a country. It ultimately took the lives of over 618, 000 soldiers (about 2% of the population of our country at that time). The generals who served during this time had been friends, classmates or roommates at West Point prior to the war. Theirs was now the task to destroy that friend to support the cause in which they believed. This was not an easy decision. The wives of these generals had to support their husbands as they wrestled with those decisions. Nancy Gere has designed Generals’ Wives, her proudest civil war fabric collection. Jerry Stube’s quilt design (by the same name) is created to honor these brave women. We honor the wives of all soldiers who fight to preserve our cause and our country. 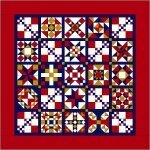 This gorgeous quilt is 100 x100 inches and includes 13 blocks, 3 different setting blocks, border and binding. Every block is prettier than the next and will entice all quilters!!! This amazing program comes with additional “easy to do” bonus projects that you are sure to love!!! The collection may be purchased as individual SKUs or as part of our new Block of the Month program. Each block offers the history of these valiant women in the hopes that the quilter will enjoy learning a bit more about them. 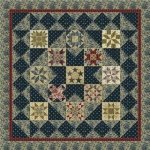 This Civil War Sampler started with a pattern but ended up with a new direction for piecing the blocks. In the end, the quilt came out very nice, thanks to Anita Peluso of Gathering Fabric Quilt Shop. and the final quilt came out just great! General's Wives being offered for fall 2011.